The August long weekend is approaching this weekend, and the forecast is calling for sun and hot temperatures. Why not get your hands busy with some DIY long weekend projects? Bring your family and friends to help out, and start next week off with a more exciting and impressive outdoor space. New paint and colors, can easily give your home’s exterior the improvements it needs. When choosing new colors and paint for your outdoor space, it’s important to keep in mind your home’s pre-existing colors and textures, such as bricks and stones. These projects are quite simple, and will only take you a couple hours to complete during the day. It’s a long weekend.. why not get your hands busy? Paint your Trims: Spend this long weekend painting the trims of your outdoor doors and windows. This will provide some visual appeal to your outdoor area, and give it a unique look. To accentuate your home’s siding, pick a trim color that is a shade lighter or darker than your siding. Garage Door Color: If you want your garage door to be the focal point of your home, you can paint it a different color than the siding of your home, so it will stand out more. If not, try painting it a similar color to the siding, and it will blend in easier. Paint your front door: There are two ways you can tackle painting your front door. One way is by removing the door before painting it, and the second way is to paint the door while its in place. Try picking a color that will add some uniqueness and vibrancy to your outdoor space. 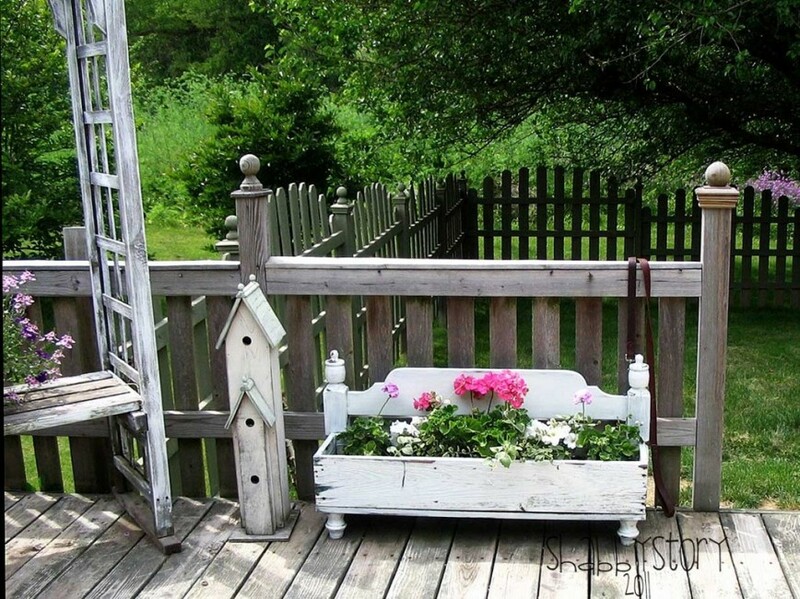 Once you see how amazing your new porch looks, you might be inspired to freshen up the rest of the area. If so, add a bench, some pillows, and perhaps some pots and pans that match with the rest of the exterior. Creating an outdoor patio with flagstone can easily be done in a weekend. 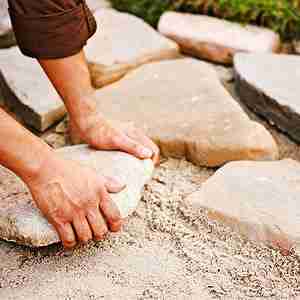 By laying down flagstone, no mortar is required, making the job much simpler. Click here for 6 simple steps for creating an outdoor patio. When the stone is finished being laid down, you can add planters, pots, and outdoor seating such as table and chairs to relax and enjoy the project you just completed. Planting inside recyclable or unwanted household items is very unique, creative, and lots of fun! Look for items around your house such as shoes, kitchen items & furniture This project is very simple and easy, and can be something that the entire family does together. 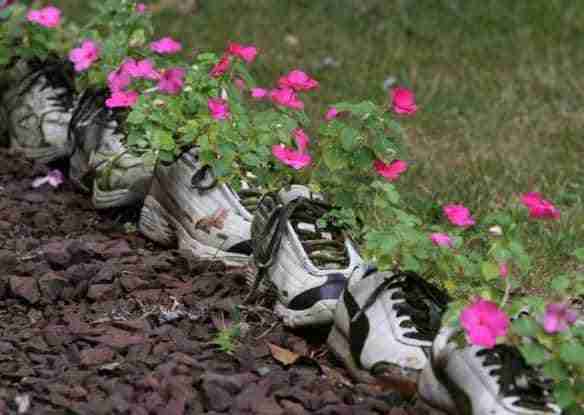 Using old Shoes: If using shoes, it is recommended to cluster different pairs of shoes together, and plant flowers inside each shoes. Rain boots will hold cascading flowers, and regular runners or heels are better for upright plants. Kitchen Items: From mason Jars, containers, fridges, and basically anything that can hold food, you could create amazing outdoor summer planter. You can take these used items, add patterns or colors to them if needed, and then place them in your garden to add some vibrancy and volume. This project is very simple and easy, and can be something that the entire family does together! Furniture: Bookshelves, chairs, desks and wagons, are all creative ideas that can be used to make summer planters inside furniture pieces. If you want to spice up your outdoor space, this is definitely the way to go. You can paint the skin of the furniture piece so it matches with the rest of your space, and can have these beautiful pieces on display outside, or inside your home. There are many different ways you can add water features to your outdoor space. 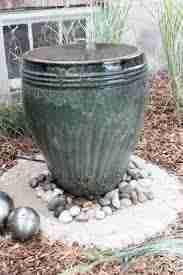 You can create something as large as a backyard pond, or something as simple as a ceramic water pot foundation. Either way, adding a touch of water can really help enhance the overall look and feel of your garden. Ceramic Pot Fountain: The ceramic pot fountain can be placed anywhere throughout your outdoor area, and is great for a small decoration. 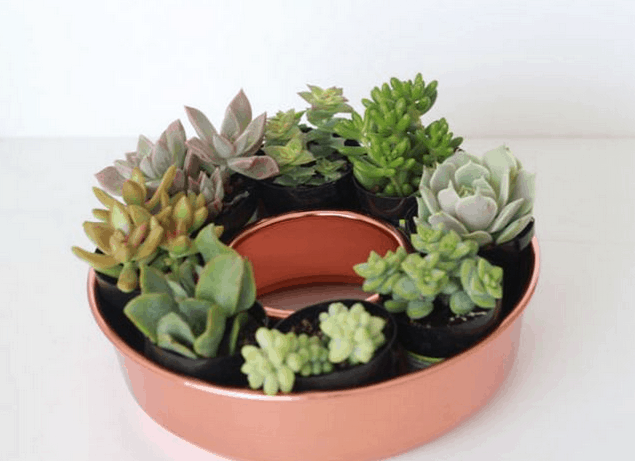 It is simple to make, and you can use any recycled pot found in your home. Click here for quick and easy steps on how to make a ceramic pot fountain. 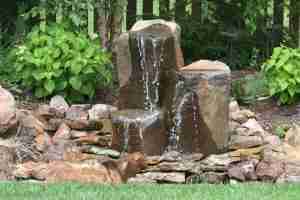 Waterfalls: Backyard waterfalls are extremely attractive and can be built in less than a day. It’s simple to build, cheap, and can be easily customized to fit in with the style your outdoor space. Click here to see how to build a small garden waterfall in a couple easy steps! Got backyard inspiration but no real desire to do the heavy lifting yourself? Contact our team and get a quote on the landscaping project of your choice.